I hope you've taken the time to read our Overview article about being a children's librarian, and decided that this is the path you want to take. Because librarianship is such a huge topic, we thought it best to split it into manageable chunks. In addition to this article, we hope you will enjoy our take on Community Outreach and Collection Development. 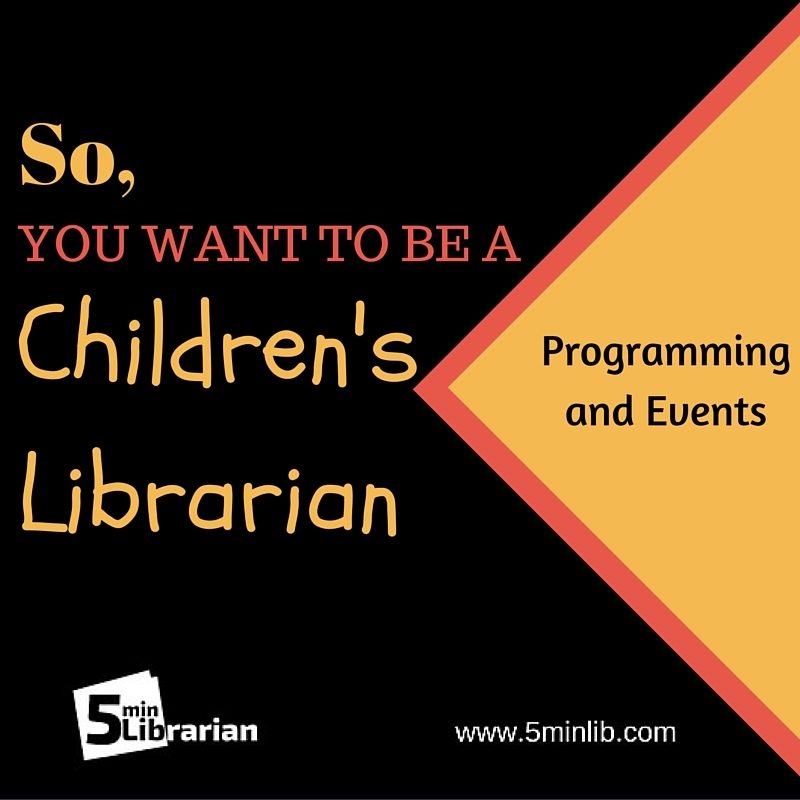 In this article, we're going to talk about programming and library events, including storytime, active vs. passive programming, and time-saving tips. Note: Is it STORYTIME, or is it STORY TIME? That's totally your call. I've seen it both ways. My only request for you is that you keep it consistent, and don't spell it different ways in different places. The first thing you have to do is decide how many storytimes you want to have. In my current library, I have a Preschool Pals, a Baby Time, and an inclusive "everybody" storytime at our smaller branch location. These are all weekly. We also do a once-a-month Pajama Time, for working parents. The timing on this one can be tricky, because it has to give parents time to get home from work and have a family dinner, but not so late that it runs into bedtime routines. I'm currently trying for 6:30, but I've gone as late as 7:30; it all depends on your patrons' needs. Once you've got the timing down, and have a room in which to hold it (preferably with a carpet or sitting pillows, because trying to get kids to sit still while in chairs is asking for a headache), you get to pick a theme, and books that fit. I also make sure to have thematic songs, felt-board, or finger plays between all the stories, and the same opening and closing songs each week (for continuity). I do 3-4 books for each storytime. Try to keep the books from being too long - just a sentence or two on a page - or nobody will be focused by the end of it. I also make sure that we have a craft ready for all but the baby storytime, that isn't so complicated that parents have to help too much. If you have the space available, it's nice to be able to put on music and set out toys for the kids to play with, and let the parents visit with each other. Some librarians have told me that they NEVER do songs, or they only read TWO books, and that's totally fine. It's all about what works for you. I find that keeping things moving (a story, and then we sing and dance and wiggle) helps keep the kids focused. Stopping the story entirely to get into a conversation about "did YOU ever go to the zoo?" and losing the whole pace of what you were doing (NOTE: I often do ask questions while reading, but I try to keep them to questions that will elicit one-word answers. "Do you think he'll be able to fix it? What color is that? How many monkeys are left?" If you ask a bunch of kids an open-ended question, their stories will last longer than your book does). In that same line of reasoning, expecting kids to answer your questions. I usually just keep it moving ("What color is this? That's right! It's blue!") even if they don't say anything. If you (or your director) are concerned more about circulation stats instead of programming, remember: the more people you get to physically walk through the library doors, the more books, DVDs, video games, etc. will be checked out. More programs = more visitors, and if they just so happen to see something they like on display, all the better. You might not think about it until you try to plan a program, but knowing kids' schedules helps a lot. If you start a program at 4 p.m., does that give kids enough time to get off the bus from school, have a snack, and get to the library? Does your 11 a.m. storytime bump into nap time, giving you cranky, tired toddlers as your audience? Is there a huge soccer tournament the day of your big movie showing, that every kid in town will be playing in and therefore not at the library? LEGO Club: dump out the bricks and let them play (Don't have any? Put out a call to action to the community. Chances are, you'll have parents and grandparents who can't wait to clean out their toy box, and you'll have a large collection of LEGOs in short order. Book-talk Book Clubs: Instead of trying to get everyone to read the same book, let people come in and talk about the awesome books they've read lately. They get to discuss what they like and get ideas of what else to read, and you don't have to spend your own time reading something you might not be interested in. We all go into this career wanting to be everything to everyone, and have programs that suit every single patron. Mother-daughter book clubs! Storytimes for all different age levels! Science experiments! Arts and crafts! The problem is, there is only so much time in the day, and there just isn't a way to get to do everything you want to do (trust me; I've tried). This problem is worse if you have a small staff (or no staff), and/or if you're trying to do teen services at the same time. This is okay: don't burn yourself out. Figure out the programs that you consider to be essential (for me, preschool storytime and baby storytime), and how often you want to run them (weekly). Then, try to weed through the rest of your ideas to reach as many demographics as possible. I keep a folder of program ideas that I haven't gotten around to, so that if I have time and nothing planned, I can inspire myself. Here's the thing: if you want to do three different book clubs, that's fabulous, but that doesn't mean you have to make yourself crazy. Lots of books out there have discussion questions already 746-written! Do a quick Google search and save yourself the time of coming up with everything yourself. Also, lots of librarian blogs out there will have great ideas for arts & crafts, and you can't go wrong with Pinterest. Interactive bulletin boards: Invite kids to write their New Year's Resolutions on a snowflake, and staple it up on the board. This works with literally any shape and concept. Write what you're thankful for on a veggie and we'll fill a cornucopia. Write what book you're reading on a flower, and we'll "plant a garden." Puzzles, board games: Whether a program or an ongoing thing, you can always have puzzles and games out for kids to play. Coloring pages and easy word puzzles: Coloring pages are always a hit. I've also printed out crosswords and word searches with varying degrees of success. Pro Tip: Make coloring even more popular by taking old, worn out crayons and melting them in a silicone ice cube tray to make new, exciting crayons in fun shapes! If you have fun with your library programs, the kids will, too. If you're not sure what kinds of things the kids your library like... ask! Or give it a try, and see who shows up. Remember, we're trying to foster a warm, welcoming, fun environment... and that goes for you, too! We hope you enjoyed the second installment of So You Want to be a Children's Librarian. Check back again for part three!